Pattaya’s police chief presided over funeral ceremonies and the cremation of a top crime-suppression officer who died last month. Superintendent Col. Thummanoon Mankhong presided over the Pattaya Police Station’s hosting duties at Krathingthong Temple in Najomtien Oct. 27, then over the cremation Oct 29 as friends and family said goodbye to Maj. Udom Kanchanawichien. Udorn, the deputy crime suppression chief, died suddenly of heart disease Oct. 25. He was 56. He was given the Most Noble Order of the Crown of Thailand designation in 2011. Superintendent Col. Thummanoon Mankhong presides over the cremation of Maj. Udom Kanchanawichien at Krathingthong Temple in Najomtien. 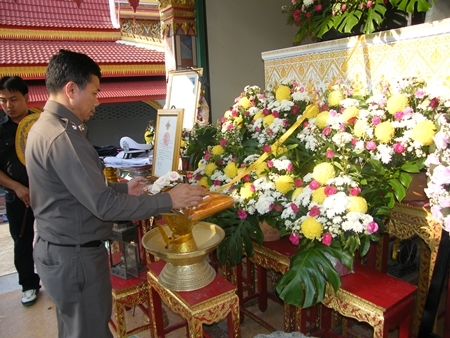 As per Buddhist tradition, family members hosted the first of four days of funeral ceremonies Oct. 26. The Royal Thai Police Academy hosted the 28th and the sons and wives of police officers and friends hosted the final day.